What Kind of Dental Problems Do Dentures Solve? It’s very common to lose teeth over time because of an injury, decay, or disease. Rather than suffer the dental discomfort and social stigma of missing teeth, you can replace lost teeth with dentures. A denture is a customized dental apparatus that consists of replacement teeth bound to a removable base or permanent implant. It can greatly enhance your dental function, facial appearance, and overall sense of confidence. It can also last for more than a decade with daily cleaning and care. By replacing lost teeth with affordable quality dentures, you can save your smile, your self-esteem, and the cost of additional dental treatment in the future. 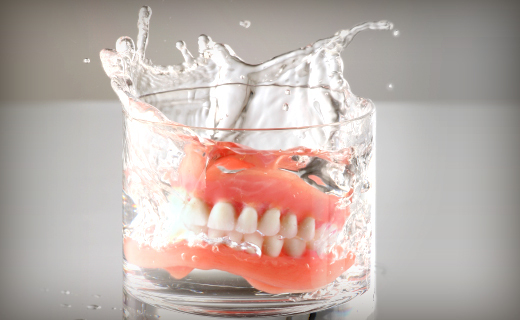 Is There Only One Kind of Denture? Full dentures are used to replace a complete set of teeth in your upper or lower jaw. A full denture can be removable and rest on your gums, or securely fixed with dental implants. For the procedure, any existing teeth are first extracted and then you are sent home with a temporary denture to wear until your gums have healed. Once your gums have healed, you’ll have your dentist place your new permanent denture. In contrast, a partial denture is used to replace one or a few missing teeth while letting you retain your residual healthy teeth. Even though it has a bridge-like structure, it is not like a permanent bridge because it features clasps that attach to your surrounding teeth. You also need to remove a partial denture nightly to give it a thorough cleaning. These dentures differ from a traditional partial denture because they lack noticeable metal clasps and a very rigid foundation. Instead, they have a pliant, weightless base and soft clasps for maximum comfort. And their flesh-toned material makes them practically undetectable, so it just looks like you have a full set of natural teeth. Instead of simply laying loosely over the gums, an implant-supported denture is firmly attached inside your mouth with either a pair or four dental implants in the bottom jawbone. This type of denture is primarily used in the lower jaw since its extra stability is unneeded in the upper jaw. Even though the denture is securely in place in your mouth, it is easy to remove every night for required cleanings. With All-on-Four dentures, you can replace numerous missing teeth with only four dental implants in your lower jaw attached to a complete set of artificial teeth. This denture gives you more biting strength and the security of a fixed denture. What Is the General Process for Getting Dentures? While the specific procedure will vary slightly by the kind of denture you want and the state of your dental health, the process only has a couple of steps. The first is having your dentist record your oral measurements and take an impression of your teeth in order to craft your final denture. The second step involves extracting any unhealthy teeth you have and providing a temporary denture for you to use until the final has been crafted. If you opt for an implant-supported denture, your dentist will place the dental implants at this point instead. Once the final denture is prepared, you will come back to our office to have it properly fitted and adjusted for full function and comfort. 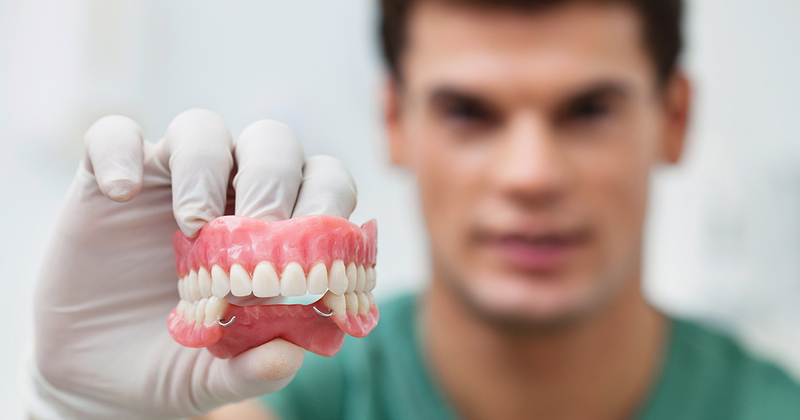 Where Can You Find Affordable Quality Dentures Near You? If you would like to replace missing teeth but worry about how much dentures cost, simply visit our dental practice. Our dentists can recommend the denture that fits your budget as well as you needs. While the price of a denture varies by factors like type and prep work required, you can be assured that our dentists can provide you with a set of affordable, long-lasting dentures. For more information about the many ways we can improve your smile, please contact our dental office. Who Should Select a Soft Denture Reline? If you want a softer, more flexible alternative to dentures with a hard acrylic lining, then a soft denture reline may be ideal for you. These relines are made of a smooth, pliable material that stays soft for several years to provide long-term protection from denture soreness and pain. Dentures are a popular answer to the problem of missing teeth. Call our office today to discover how our high-quality dentures can help you reclaim your smile.